DNS Amplification Variation Used in Recent DDoS Attacks (Update) describes how public DNS servers can be used to amplify the effect of Distributed Denial of Service (DDoS) attacks - resulting in some of the largest and most disruptive attacks reported to date. The DDoS That Knocked Spamhaus Offline (And How We Mitigated It) describes a large 75Gbps attack using DNS amplification. An even larger 300Gbps attack causes wide scale disruption, see What you need to know about the world’s biggest DDoS attack. DDoS describes how the sFlow monitoring standard can be used to rapidly detect and mitigate DDoS attacks on the target (victim) network. 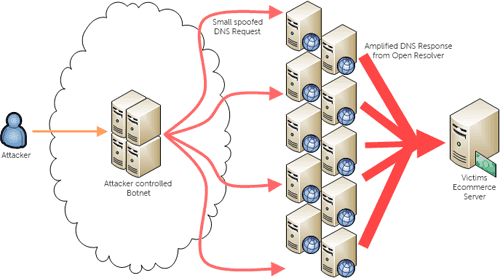 This article will examine how data centers that may be inadvertently hosting open DNS servers can use sFlow to identify servers participating in amplification attacks. A hosting service provider has very little control over the services running on the physical and virtual servers running in the data center, and while one might hope that the customers carefully configure and monitor their DNS servers, the reality is that there are many openly accessible DNS servers. Using the network switches to monitor DNS operations is an attractive option, offering an agentless method of detecting and monitoring DNS servers wherever they are in the data center. sFlow is embedded within switch hardware and can be enabled in high traffic production networks without impacting performance. sFlow exports packet headers, allowing sFlow analysis software to perform deep packet inspection and report on DNS operations. 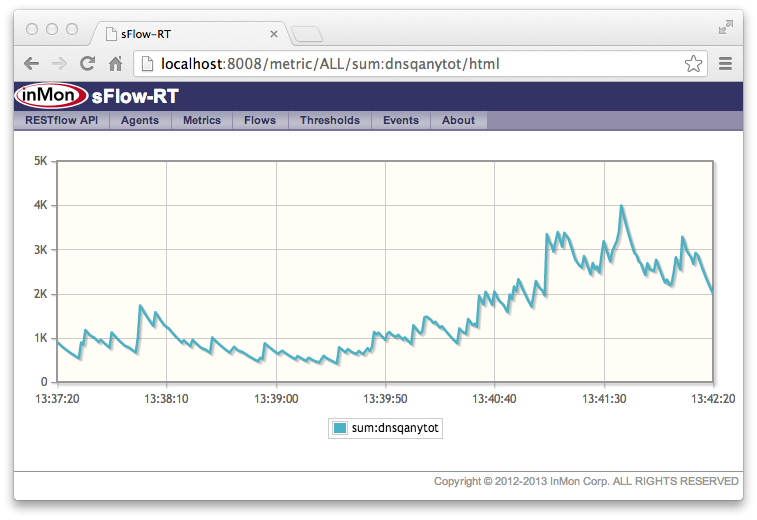 In the following example, a single instance of sFlow-RT is monitoring 7500 switch ports in a data center network. domain name in query dnsqname yahoo.com. The table above (http://localhost:8008/activeflows/ALL/dnsqueries/html?aggMode=sum) shows a continuously updating, real-time, view of the top DNS queries - a bit like the Linux top command, but applied to the active flows. 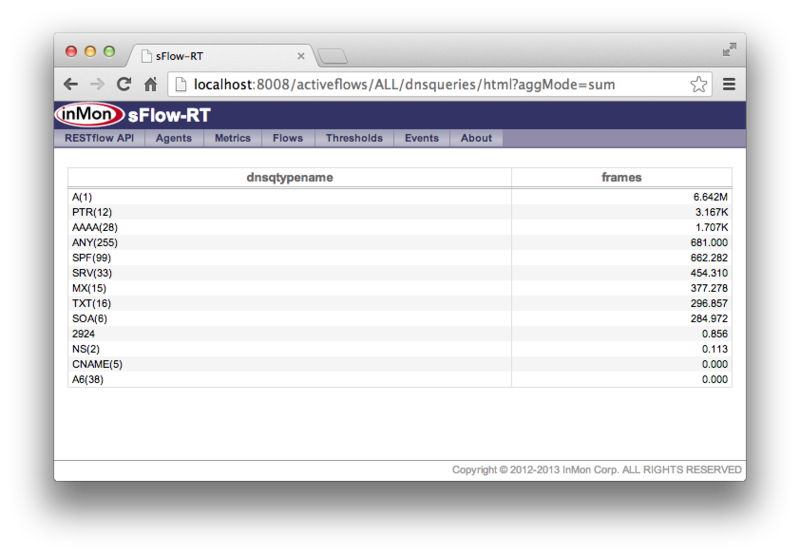 The table shows that the fourth most frequent query is the ANY(255) query type. The ANY(15) query is often used for DNS amplification attacks since it asks the name server for all the records within the domain, resulting in a large response that amplifies the traffic in the attack. The above chart (http://localhost:8008/activeflows/ALL/dnsqany/html?aggMode=sum) looks at the domain names being queried by the ANY(15) queries. Domain names in the list are known to be associated with DNS amplification attacks, see DNS Amplification Attacks Observer, so it appears that there are open DNS servers being used to amplify DNS attacks in this data center. The trend chart above (http://localhost:8008/metric/ALL/sum:dnsqanytot/html) looks at the overall level of ANY(15) requests in the data center. The trend is increasing as a new DNS amplification attack is launched. Incorporating sFlow analytics in a performance aware software defined networking solution offers the opportunity to automate a response. 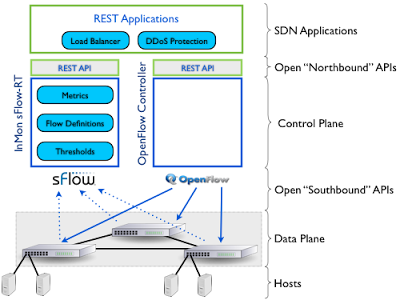 By itself, OpenFlow is not DNS aware, however, combining the detection capabilities of sFlow with OpenFlow rules to selectively steer traffic based on IP source, destination, protocol and port allows attacks to be blocked, or for a DNS proxy to be inserted in the packet path to selectively drop requests. While this example focused on a data center hosting DNS servers, a similar approach could be used to monitor campus networks. Detecting hosts that are spoofing their source addresses and generating suspect DNS requests is a useful signature for identifying compromised hosts. In this case, the SDN controller would respond by isolating the compromised system from the rest of the network. DNS amplification attacks are a serious problem that is difficult to address because the attacker is two steps removed from their victims (hidden behind compromised hosts and open DNS servers). DNS amplification attacks have limited impact on the intermediate networks and may go unnoticed, even though the combined effect of all the traffic arriving at the target network can be devastating. Software defined networking offers the promise of intelligent networks that can automatically respond the changing traffic conditions and security threats, providing a way to share and automate best practices and reducing operating costs to the point where intermediate networks can play a larger role in reducing the impact of these attacks. i just start working in dns amplification and i see that this post it's very useful but i don't know what to start with ? and how use this script to intercept dns data? I am doing my minor project "mitigation of DNS amplification attack in Software Defined Networks". But i don't know how to do that in mininet. can you please help me how to perform DNS amplification attack in mininet and then how to mitigate it. please brother help me , i will be very thankful to you. ONOS measurement based control provides an example.